The last four weeks have been quite dry, with Sea Tac Airport receiving about 2.5 inches less than normal over that period (see plot, cyan color is normal). But everything changes this weekend, with substantial precipitation heading our way. A good weekend to finish you taxes (as I will be doing myself). The first, weaker, system is now coming in, and the next 24 hours will bring light rain to the lowlands and modest rain to the coastal mountains and the Oregon Cascades. 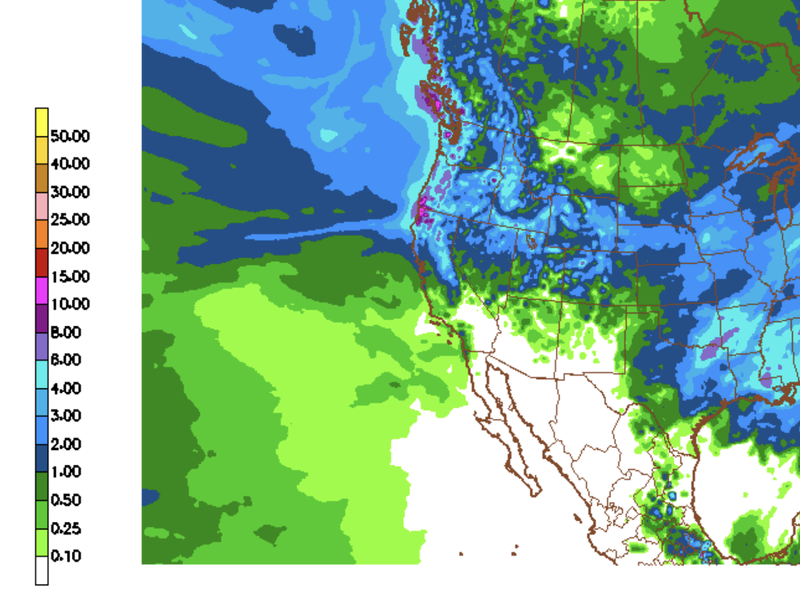 On Sunday, a potent atmospheric river of moisture will hit British Columbia, with only light stuff over Puget Sound and Oregon during the 24 h ending 5 PM Saturday. Saturday will be the day to take that walk and enjoy the fading cherry blossoms on the UW campus. But Saturday night, the atmospheric river will push into our region. This image shows the transport of water vapor by the atmospheric river (it shows something called integrated water vapor transport). A plume of water vapor is directed from the subtropics into our region. As this current of water vapor is forced to rise by our terrain, it cools and converts much of the water vapor into precipitation. This is shown by the 24-hr precipitation total ending 5 PM Sunday. Very wet, with some areas in the mountains getting over 2.5 inches (black colors). But most of that precipitation will fall on Sunday morning and by lunchtime you can head outside again. Do your taxes in the morning. Climatologically, April is a month of substantial drying in western Washington. 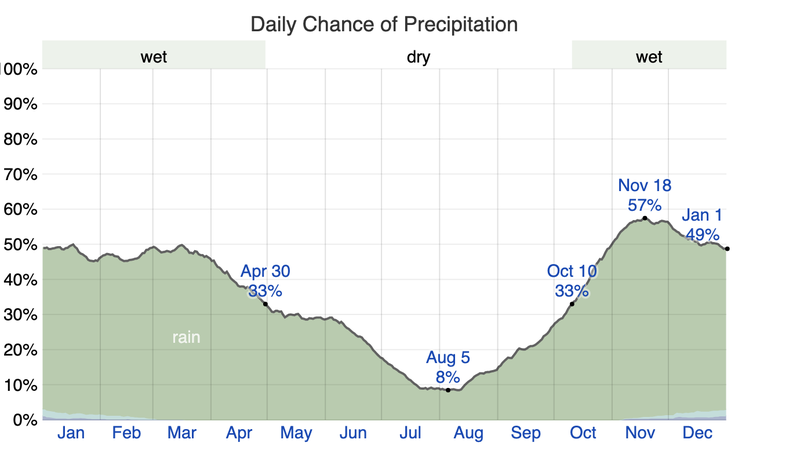 For example, the climatological probability of getting a trace of precipitation in Seattle goes from around 50% in the beginning of the month to about 32% at the end. Big drop. Then we plateau in May at around 30% before the big decline in June and early July. And the average monthly (30 day) rainfall drops from about 4 inches to 2.2 inches this month. Thus, if the 16-day National Weather Service total precipitation forecast is correct (see below), we probably are in store for at least a normal month in terms of precipitation. Perhaps you can work on your taxes next weekend as well. I just read an article that researchers from NOAA and UCSD have developed a scale to rate atmospheric rivers. Has anyone rated this one? That plateau in May is interesting because at my eastern Washington location, precipitation steadily drops from the beginning of the year, bottoms out in March and actually increases in May and June before really falling off. I’ve always found it interesting because here, or pretty much anywhere, would think it would be a straight peak to a straight bottom. I’ve always attributed it to a destabilization of the upper atmosphere, intense radiation and still a relatively moist surface of soils and vegetation. Precipitation mostly due to heavy convective showers so it’s feast or famine. That skews the figures some. I don’t know the statistical term of a lot highs and a lot of lows making a normal lol. I really like the monthly average rainfall graph with the, I suppose, 1 and 2 sigma bands. Great visual! Rain is welcome for gardeners! I actually like the rain as I'm accustomed to it. But, it's best with a balance of sunshine this time of year. You can have too much of a good thing. Your blogs are always fun to read and keep me learning, Cliff. Not only "wet" but windy too, apparently. A wind advisory issued for most of Western WA because of "meso-low" formation. Brief period of strong winds 20 - 35 mph gusting to 40 - 55 mph from the SW.
what do you make of the statements by climate researchers that for every 1C of warming of the oceans and atmosphere, we get a 7% increase in water vapour, thus more extreme wind/storm patterns, with massive dumping of precipitation? There has already been a 'drought emergency' declared on Central Washington's East side rivers! This seems a little premature to me and with this current weather pattern the water supply has got to increase. Anyone else think this seems a bit strange? perhaps its an attempt to access drought money for these river basins? Rained cats and dogs last night in Salem! Best soaking in what seems like months. We have a beautiful park, Minto-Brown, that lies in a flood plain along the Willamette River. It typically floods about once a year, but until now has been high and dry. I suspect the recent deluge has changed that. Maybe this will increase, but it looks like most of it is going to the south and east of the mountains.